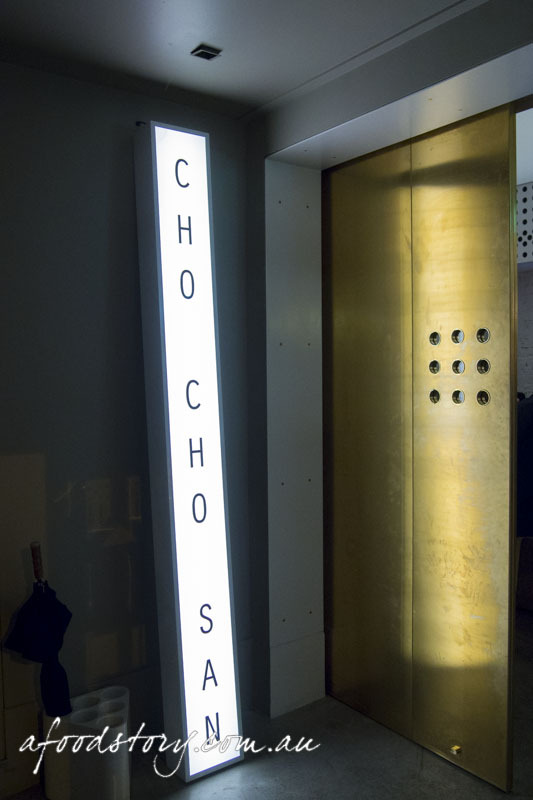 Cho Cho San is the second joint venture of restaurateur Sam Christie and chef Jonathon Barthelmess (the first being The Apollo). Ever since opening in June the interwebs has been filled with smoked duck steamed buns, Petuna ocean trout, fried chicken and udon. With Japanese being one of Dylan and my favourite cuisines we had to get there to suss out the fusion factor. I’ll admit it. I was disappointed not to see the duck buns on the menu. Why remove them from the menu when everyone is writing about them? That’s just not fair. With no duck buns on the menu and three rather stuffed chums following our epic session at Papi Chulo, ordering became a little difficult. We decided to order light. Beef tataki, wild rice, ginger dressing ($18.00). It started with beef. 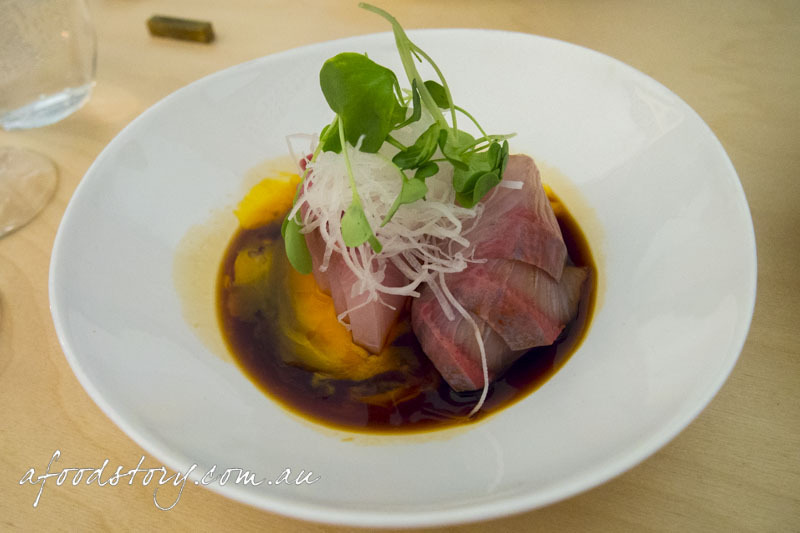 Beef tataki – a Japanese classic and one of Dylan and my favourite dishes. The slivers of beef short rib were ribboned with fat and looked a treat. Though having said that it looked quite different to normal as the sauce was in the bottom of the bowl and we’re more familiar with seeing meat bathing in a pool of sauce. Nevertheless we were curious. Lurking beneath the beef was the wild rice and citrus dressing which was big and bold, but I felt a slight disconnect between the beef and the dressing, the beef didn’t taste marinated or as tender as one would hope and the lack of searing threw us. 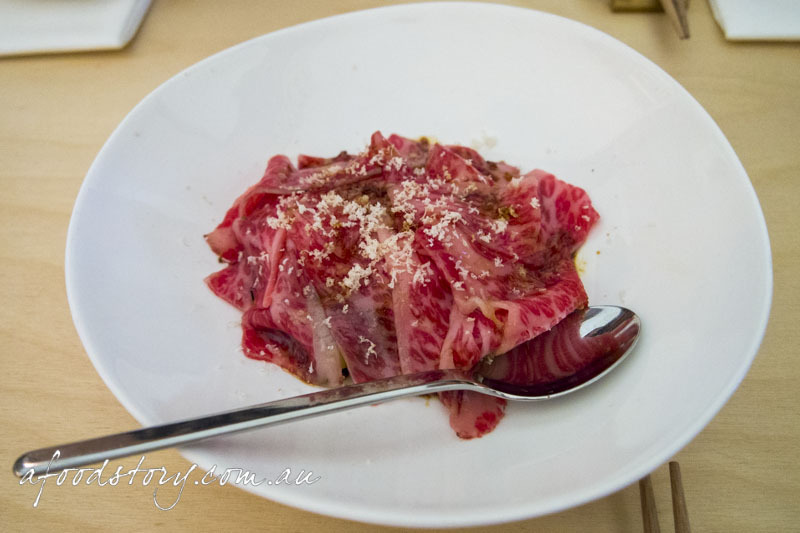 A different take on a beef tataki, that’s for sure, but one that left us underwhelmed. Hiramasa Kingfish, daikon, soy ($20.00). To continue with the not so heavy dishes Dylan had to order the kingfish which arrived next and looked quite splendid with a mountain of thinly grated daikon on top. 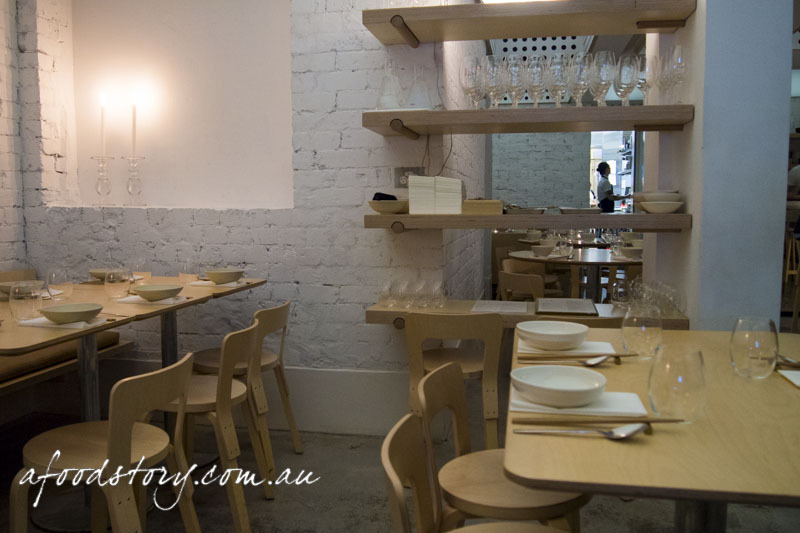 Where the beef tataki missed the mark the kingfish hit home runs. Even though it was thickly sliced the silky sweet fish sung and there was nothing that was going to stop this from being a wonderful dish. Accentuating the already marvellous dish was egg yolk soy swirling in the bottom of the bowl, giving an already stellar dish another smashing texture. Beautiful produce can speak for itself, but these insightful additions made this fish king. Hokkaido scallops, corn, house-cured katsuobushi ($18.00). 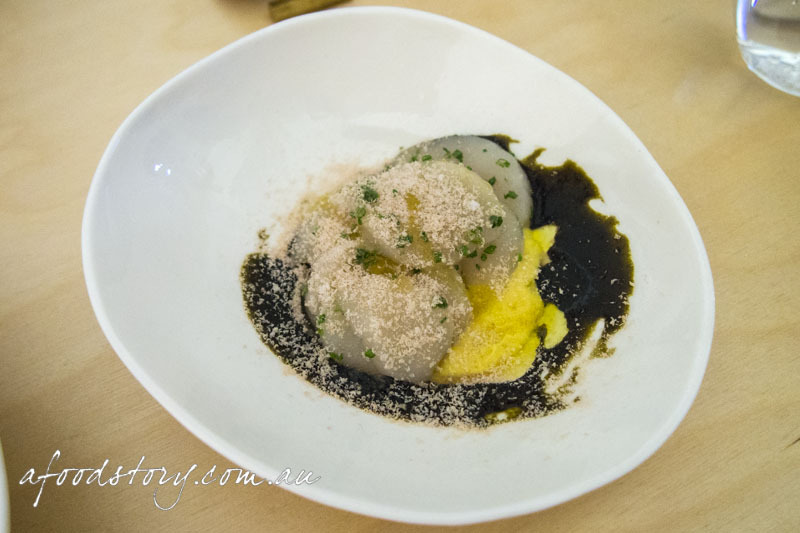 Em’s choice, from the ‘raw’ section of the menu, was scallops presented thinly sliced on a bed of corn puree and nori paste with a decent scattering of bonito flakes on top. It was evident to see the quality of the scallops though sadly we found the bold flavours of the nori and bonito overpowering. The sweetness from the corn was also a dominant factor and while the elements on their own were exceptional the accompaniments overshone the natural delicate sweetness of the scallops making them feel lost in a sea of big flavours. I couldn’t help but feel disappointed. Udon noodles, pork, chilli ($15.00). Udon are one of my favourite noodles of all time and regardless of how much we’d scoffed at lunch the udon was to make an appearance at dinner. 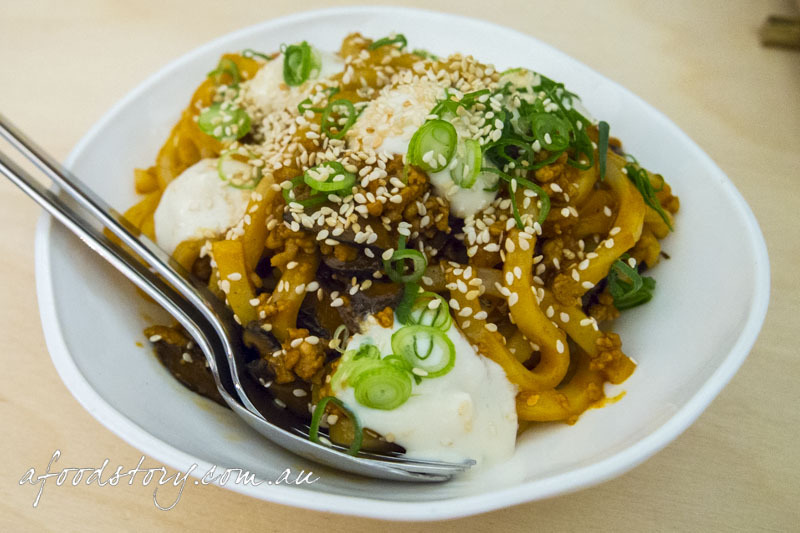 Pleasingly al dente noodles tossed with coarsely minced pork – perhaps a twist on an Italian bolognese – with blitzed tofu for a creamy touch and a sprinkling of sesame seeds and spring onion to finish. It was everything I wanted it to be: rich, hearty, umami. The chilli was rather mild to begin with but grew with the progression of the dish – it was definitely not a punch in the face kind of heat but a milder, tummy warming heat. And while I doubt you’ve ever find anything like this in Japan I would quite happily devour a bowl of this often. Japanese comfort food. Our final dish took me by surprise, although I’d read the menu and knew the ingredients of the dish, when the calamari arrived at the table I was a little taken aback. I’m not sure why but I wasn’t expecting it to be served as it was. Probably because I’ve not had octopus like this in a Japanese restaurant before. 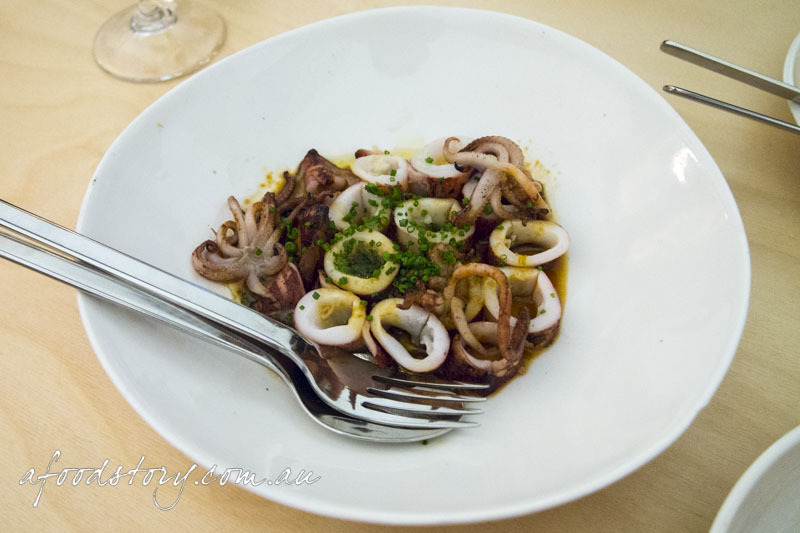 Lime ponzu dressing was fragrant and zesty but couldn’t do much for the chewy, rubbery calamari. Sadly this was the entire table’s least favourite dish of the night. The Scandinavian aesthetic and atmosphere of the space are great. The udon fantastic. But with all the hype my somewhat high expectations weren’t really met. 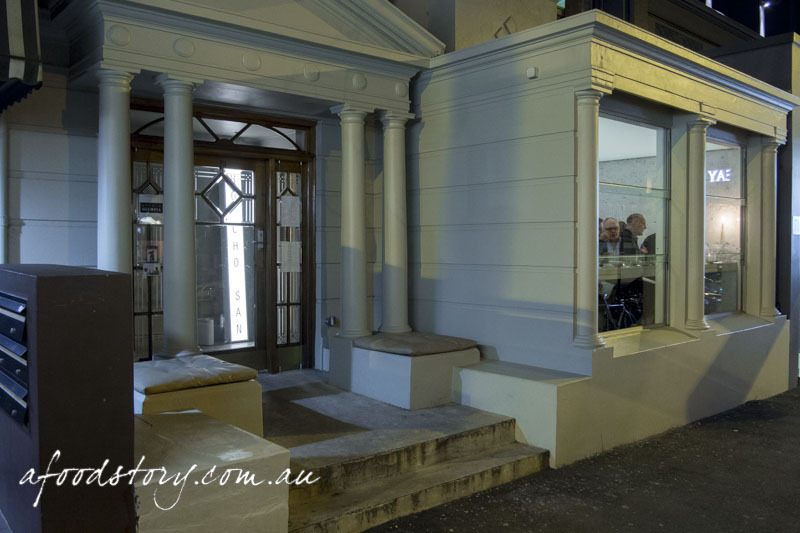 I’m glad I’ve been and am curious to return and see what other interesting dishes the team are plating up. But for the whole I wouldn’t rush back, unless of course I had a craving for that udon dish. That dish is definitely worthy of a repeat visit.